First I have designed this set for myself - but I have in plans something earlier and more plain - for my simple practice fencing (12-13th c.). As you can see the sword itself is very simple, reflecting a many typical features of 14th European battle longsword, let`s say from central and eastern Europe rather. Scabbard design is related to Teutonic Order, German knights - I mean the style and composition. This scabbard can be dated to late 15th century as well - we know some examples with replaced later grips or scabbards - personally have examined 2 pieces in Poland: 13th and 14th century swords with later scabbards, highly decorated leather work (15th and 16th centuries). In my opinion there is very interesting contrast between such simple, battle sword and decorated scabbard. It makes this even more authentic and gives some history background and character to the sword. I have called the sword the KOMTUR - which means a Knight Commander, and it is a title of honor prevalent in chivalric order and fraternal orders. (more about this with full description, more pictures and data you will find on my website). "Scabbard and belt for this sword reflects a German style with black colors combined with gold and silver fittings. Belting style from 13 / 14th century is combined with simple functional buckle. Both details also reflects Teutonic Order canon." 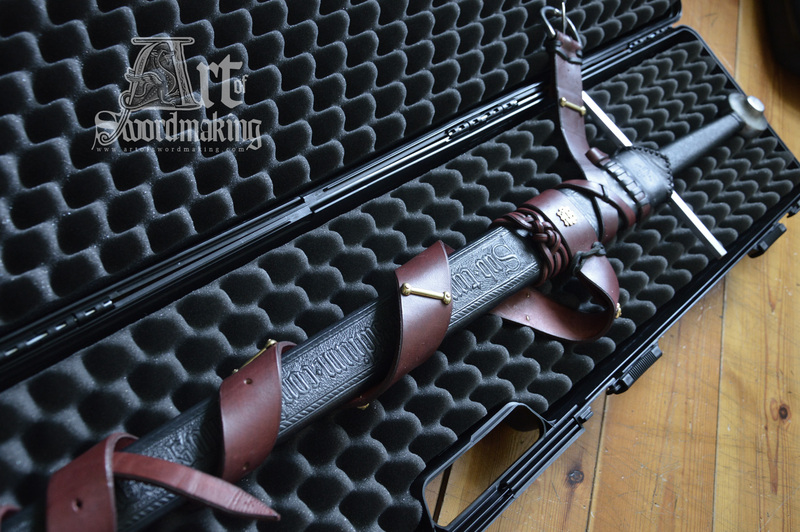 Price for this sword with scabbard and belt is $2600 plus shipping cost (usually circa $60). What a fantastic piece of art! The fullers are beautifully straight, and the scabbard tooling is on a whole other level!!! Thank you for all that you do! Absolutely wonderful Maciej! I'd grab it, but I must save for a different sword from you I think. Very well done, I love it. This is actually a second edition of my design for Teutonic Order sword. This thing is brilliant! But since I already have a project on your list, and have a chaser project in mind, and have been unable to figure out how to get money sprouting on the tree out front, it has to go to some other lucky soul! Thanks for your opinion, Joe I`m glad you like it. will work soon with your blade too! and here I attached a new shipping option for my swords - with some new sword. little price drop to 2500. shipping included. I simply can not change the title after 14 days - so I make this update.